Hyrule Warriors: Definitive Edition (Switch) comes out on May 18th in Europe and North America. Hi, getting out of the office today and taking you with us to do a little game shopping. Donkey Kong Country: Tropical Freeze came out today for Nintendo Switch so we thought we would run down to GameStop and pick it up for you guys. Let us know if you like this style of video. We want to try to talk to you guys more so we’d love to hear what you think. We also hope you enter for a chance to win this game. The sweepstakes rules are below! As always, thanks so much for watching and we’ll see you next week. Want to get 100 extra Platinum Coins for My Nintendo? 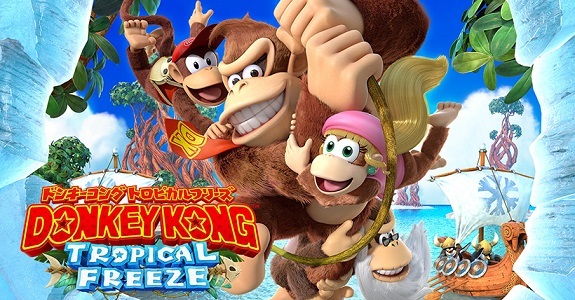 If yes, just head over the Donkey Kong Country: Tropical Freeze official website, and find all the KONG letters hidden there! Unfortunately, this special mission is only available for players who have a North American Nintendo Account, as there does not seem to be a similar one in Europe (or Japan, in fact).